Imagine New York in the late 1970s: the post-punk era, smoky underground clubs. There is where the terms ‘Mutant Disco’ and ‘No Wave’ were forged and brought to live by an élite group of artists: musicians, poets and painters willing to break with the past, exploring and exacerbating old habits. ZE Records, founded in 1978 in New York by British Michael Zilkha (Z) and French Michel Esteban (E) was the perfect fit for exponents of this new musical and cultural trend. Producing several independent artists during their NY years (Lizzy Mercier Descloux, Was (Not Was), Kid Creole and The Coconuts – to name a few), ZE Records reached worldwide exposure through its licensing deal with Island Records. The label’s success and influence peaked around 1981-82. 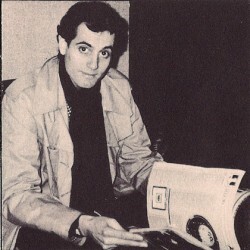 Esteban left New York in 1982 and ZE Records closed down in 1984. In 2003, he restarted the ZE label in France to record new artists. I got to chat with Michel Esteban (pictured left in 1979 at Blank Tapes Studios), a man still in love with his job after almost 40 years. What is your favorite thing about running a record label? The best thing in life is doing what you like and not thinking you are actually ‘working;’ and if you can make a reasonable living out of it, you are very close to happiness on a professional level! More specifically, the best part is when you are in studio helping people to make the music they have in mind and having fun doing it! What is your favorite way to discover new music (online, offline, live)? Today, due to the fact that I am living on a tropical island in the middle of the golf of Siam, I would say online, but LIVE will always be the best way to discover new music for me. Tell us about an album that you put out that taught you the most about running a record label. I don’t have one in particular, it is always a new experience when you put out a record, especially when your concern is not what people or journalists think about it, but if the artist and you are happy about what you have achieved, and if gets as close as possible to the original idea both of you had. We are obviously happy when the media and the public like it, but if they don’t and we do, that’s good enough for us! What are you must-listens for 2016? I am curious about all kind of music, but I must confess that due to my age, it is getting harder for new releases to draw my attention. When you have been listening to music for more than 50 years, you know the tricks! Last year Kendrick Lamar impressed me the most, and it is in Hip Hop that I found innovations in terms of writing and production. What piece of advice would you give other label owners? In the last issue of Whole Earth Catalog, which was a sort of bible for the youth at the end of the 1960s, they wrote this sentence on the back cover: “Stay Hungry. Stay Foolish.” Steve Jobs in his famous speech at Stanford University recalled that sentence and added “You’ve got to find what you love.” That’s a good piece of advice. Don’t listen to anybody and do what YOU like! If you are right, you can succeed; if you are wrong, at least you will have done something you like! Where do you see the industry headed? We are obviously in the middle of a total revolution in terms of how people ‘consume’ music, and the music business has problems to adapt to it. When digital arrived, I was very optimistic because physical distribution was the main problem for indie labels. Now even a guy like me, lost on a small island in the middle of nowhere, hundreds of miles away from a record shop, is able to find all the music available in the world from his computer. But the issue with digital is that he can also download it for free! I am still very optimistic because I think people nowadays listen to more music compared to the past, the industry has just to find a way to make a decent living for people who create it. Name 10 tracks that made the history of ZE Records. “Re Bop” by Marie et les Garçons, “Dream Baby Dream” by Suicide, “Contort Yourself” by James White and The Blacks, “Fire” by Lizzy Mercier Descloux, “Christmas Wrapping” by the Waitresses, “I’m a Wonderful Thing Baby” by Kid Creole and The Coconuts, “Jukebox Babe” by Alan Vega, “Tell Me that I’m Dreaming” by Was (Not Was), “Disco Clone” by Cristina, “Les brunes comptent pas pour des prunes” by Lio.